in the eastern and western hemisphere. 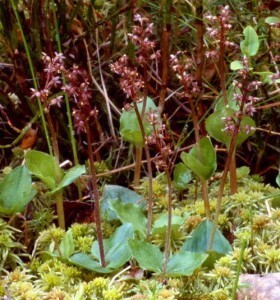 In Lid Norwegian Flora and Biodiversity Information Name list, the genus Listera two species which are Common Twayblade (Listera ovata) and Lesser Twayblade (Listera cordata). 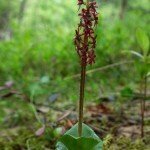 Common Twayblade is a large and powerful plants that may grow up to 80 cm high. It is easy to spot even when it is between other green and tall plants, but are usually bypassed when the flowers of Common Twayblade not eye catching. 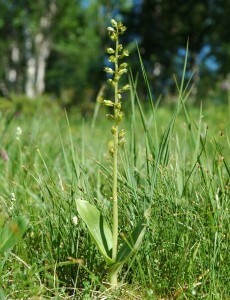 Common Twayblade has two opposite ovate leaves up to 10 cm located underneath the middle of the stem. Inflorescence is long & flowers rich with green flowers. The lip is yellow-green with parallel lobes, and has a nectar-filled strip along the centre. The flower pollinated by numerous insects like beetles, two-winged flies, wasps and parasitic wasps. Common Twayblade does not seem to have problems with insect pollination when it produces plenty of seed capsules. Common Twayblade is fairly common and can be found scattered in the lowlands and into the mountains in most of the country north to Alta in Finnmark, but it is rare in Aust-Agder and Rogaland, and lacking in Vest-Agder. It grows on calcareous forest floors in herbaceous forest, meadows, pastures, on heaths and mires. 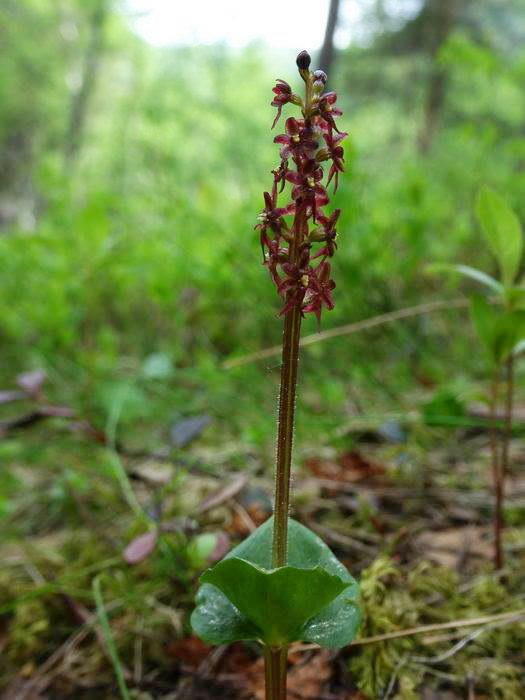 Common twayblade has not tubers, and can form large populations by vegetative division. 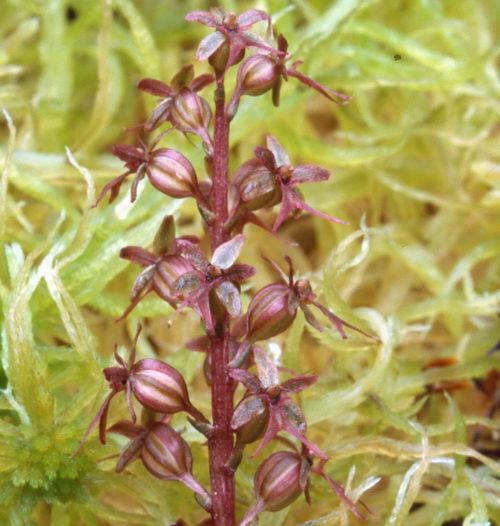 Lesser Twayblade is a small plant that is not easy to catch sight of. It blooms in the lowlands in May and earlier than Heath Spotted-orchid. 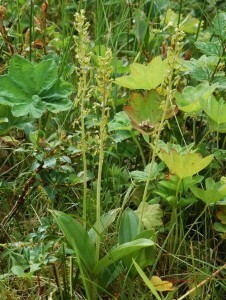 Lesser Twayblade is 5-20 cm high and has two oppositely disposed, heart-shaped leaves about the middle of a straight stem. Stems are crispy and thin. The flowers are sitting long on and are few and brownish-green. Flower lip is maroon, split in two with divergent lobes. 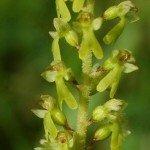 Lesser Twayblade which can also be self-pollinating are pollinating of small two-winged flies, parasitic wasps, bees and ants. Fairly common across most of the country, but is less common in Finnmark, and in coastal areas in Southern and Western Norway. 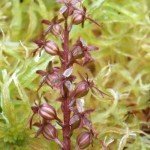 Lesser Twayblade is not regarded as lime-demanding and can grow in damp and mossy places in coniferous and deciduous forests, and heaths. 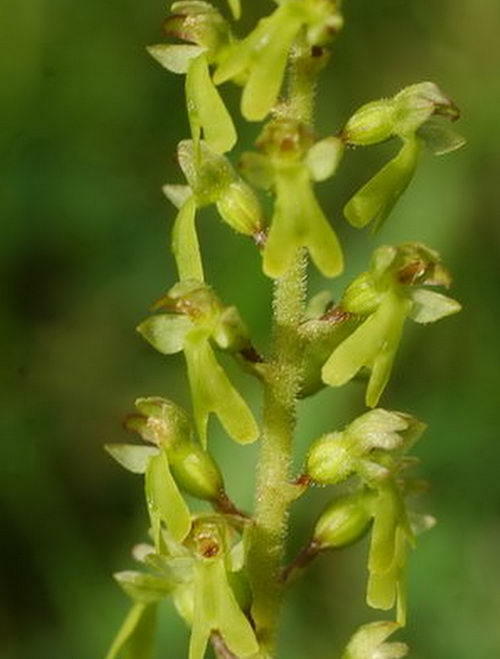 Lesser Twayblade has not tubers, but a short horizontal rhizome, and it can form large populations in a small area.